Fairy Tail 304 is now available up next, and this is the beginning of the moment we’ve all been waiting for. The final battle is about to start between the new 5-man team of Fairy Tail vs Sabertooth. Meanwhile Natsu, Wendy and Mira secretly went on another mission to try and rescue Lucy, just in case the army will not hand over Lucy even if they win. The next chapter is entitled Daimatou Enbu, and obviously we are nearing the climax of this arc. Find out what happens next in Fairy Tail 304. UPDATE: Fairy Tail Chapter 304 is now available. You can begin reading this chapter on popular manga sites online. Before I proceed, let me just want to say that I enjoy Fairy Tail manga, including the anime series. I do not claim that I know all about Fairy Tail. I’m not Hiro Mashima. But I enjoy making articles likes this so that I can reach out to other Fairy Tail fans out there who also loves to discuss things about what is happening in the Daimatou Enbu arc. So if you know stuffs that we don’t know, please do share your thoughts below. I also moved the spoiler section below, since there are people who do not want to get spoiled by reading articles like this. Moving on, the last chapter revealed to us the real plan of Fairy Tail. They will try to win the Daimatou Enbu with their newly formed group, at the same time try to rescue Lucy. From the looks of it, I think even if Fairy Tail won the Daimatou Enbu, the army will not release Lucy since she is part of their plan. They need her for something connected with the Dragon King festival. Good thing that Natsu, Wendy and Mira are on their way to rescue her. While on the ring side, it is a 5 vs 5 between Sabertooth and Fairy Tail. 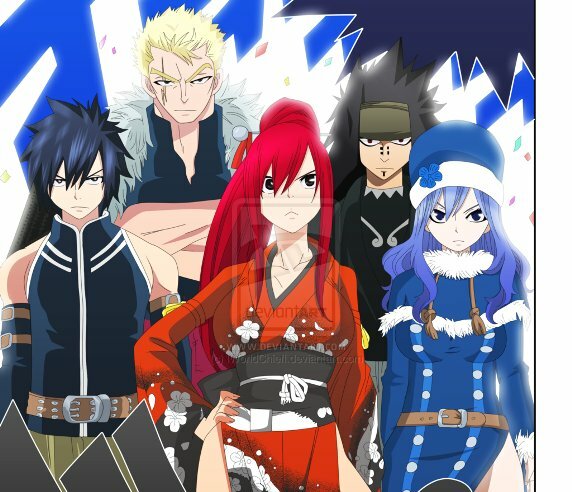 If the final match would be a one on one, I think Erza will face Minerva, Sting will face Gajeel, Rougue vs Grey, Orga vs Laxus and it will be Rufus vs Juvia. I’m pretty sure with the new Fairy Tail team, they will beat Sabertooth and pound them. Fairy Tail 304 spoiler will be posted on this section. I’m not really sure if Fairy Tail chapter 304 raw scans or confirmed spoilers will be shared. But if ever there is, I’ll place it here. Anyway, I’ll update this post once Fairy Tail 304 is released. Stay tuned!